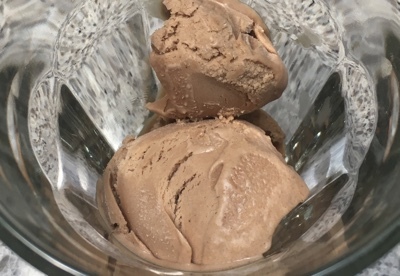 The recipe is adapted from Alice Medrich’s milk chocolate lover’s hazelnut ice cream, from Seriously Bitter Sweet (2013). In a large glass jug, melt the gianduja in the microwave. I heated it at 50% power in 30 second intervals, stirring after every zap. How long depends on the power of your microwave; mine took about 2 to 3 minutes. Set aside, at room temperature. Whisk the egg yolks in a small jug. In a sauce pan, combine the cream, milk, both sugars, and salt. Stir over medium heat until simmering. Pour the custard through a fine-meshed strainer into the large jug with melted gianduja — to remove any curdled bits, or chunks of vanilla bean from the sugar. Gently whisk until the hazelnut-chocolate has been smoothly mixed into the custard. This was written by sairuh. Posted on Sunday, July 9, 2017, at 11:15 am. Filed under Food. Tagged chocolate, hazelnuts, ice cream, recipe. Bookmark the permalink. Follow comments here with the RSS feed. Post a comment or leave a trackback.